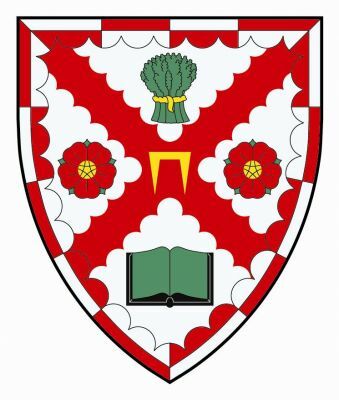 Arms: Argent on a saltire engrailed Gules between a garb Vert banded Or inchief and an open book of the Third (Vert) binding and fore-edges Sable in base and two roses of the Second ( Gules ) barbed and seeded of the Third ( Vert) in the flanks, a staple of the Fourth ( Or ), within a bordure invected counter company Argent an Gules. Matriculation, page 95, vol. 65 of the Public Register of All Arms and Bearings in Scotland, dated 19 Feb 1984. BG John H. Napier, III, ASDF, MA died 27 Dec 2016 in Alabama his home state. He was a Charter Member of the SSA, a long term member the Veteran Corps of Artillery, State of New York ( VCA ) and the Military Society of the War of 1812. BG Napier was a Commander in the Order of St. John. The SSA Secretary was notified by Mrs. Napier.